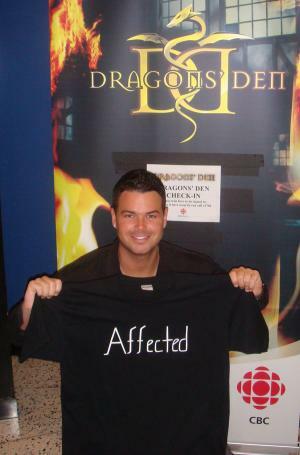 Did This “Affected” Young Man Get A Yes From Dragon’s Den? Brady Thrasher wants to know what’s affected you, and then for you to buy the T-shirt. The 23-year old Windsor, Ontario entrepreneur is the founder of the Affected Campaign, a line of clothing sporting the word “Affected,” which allows purchasers to direct a portion of the purchase price to the registered charity of their choice. Launched in September 2007, Affected has been able to donate nearly $8000 to 107 charities in Canada and abroad since its inception. From the sale of each $20 shirt (tax included), $6 is taken off the top for the registered charity designated by the purchaser. Because he prints the shirts on-demand without a large volume contract, each shirt costs him approximately $7.50 to make and the remaining funds are used for marketing and advertising, whether at charitable events or on kids soccer team uniforms. Thrasher has been amazed by the number of different causes represented by Affected product sales: everything from national charities working to eradicate MS, cancer, drunk driving and heart disease to local shelters, diseases he wasn’t previously aware of, and individuals undertaking humanitarian missions overseas. Thrasher knows a bit about being affected. Growing up with a father who had multiple sclerosis and cancer and died when Brady was only 15, he has always been involved in raising money for causes close to his and his family’s hearts. At age 8, he started raising money through pledges for the Super Cities Walk for MS in Windsor, which his father, Pat Thrasher, started and is now Canada’s second largest. By 18, he says he had become one of the Walk’s top raisers, managing to bring in more than $2000 — not bad for a teenager. Inspired by his honesty and courage, in three weeks of campaigning the 670 students at General Amherst went on to raise $76,000 that year, nearly doubling the previous year’s total. “It was a huge achievement and one of the best days of my life,” he says, referring to the day of the Walk. Buoyed by that success and searching for an idea for a business class proposal while a sophomore at St. Clair College, Thrasher hit upon the concept of a line of clothing that could raise money for any charity. He was impressed with the Product Red line, which raises money for AIDS in Africa by licensing the brand to companies such as The Gap, Converse and Apple Inc., but wanted to create something that would support multiple charities and would mean something personal to each wearer. More than just a charitable clothing line, Thrasher likes to think of Affected as a social movement. 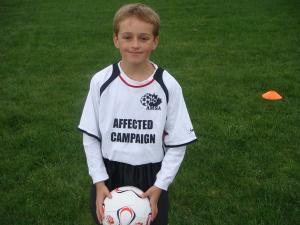 “Affected puts us all on an equal playing field, showing us that we’re not judged by one another. We’re all affected. [It’s important], especially in a high school setting — that’s where I learned that I was hiding the things that were going on in my life to save people talking behind my back — so I just think that I can even use the Affected campaign and turn it into a character development program and instil it within high schools,” he says. In the past two years, he’s had Affected shirts personally delivered or sent to more than 300 people in the public eye. 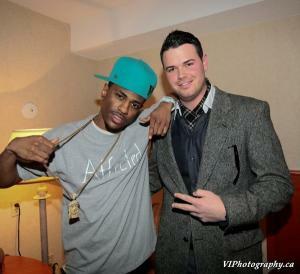 Kanye West received one from a member of Thrasher’s marketing team, Detroit-based rapper Big Sean, who just happens to be signed to West’s G.O.O.D. Music label. He says the shirts are also in the hands of the cast of MADtv, Entourage actor Jeremy Piven, musicians Sam Roberts and Faber Drive, and even talk show host Ellen Degeneres. After being contacted by producers of The Ellen Degeneres Show regarding the line, Thrasher wore an Affected T-shirt to the taping, hoping for a mention. Even though that didn’t happen, he was featured, while wearing the shirt, as the “dancer of the week” on the show’s website. In the meantime, the Affected product line can be purchased online through Thrasher’s website at http://www.affectedcampaign.org. New products will be for sale as of February 25.